Many fans have been eagerly awaiting a sequel to Pacific Rim ever since they left the theater in 2013. Pacific Rim 2 is still coming, that much is certain, but the wait for the movie just got a little bit longer. It has been announced that Legendary Pictures and Universal have decided to push the movie back by exactly a month, shifting Pacific Rim Uprising from February 23, 2018, to March 23, 2018. The news comes courtesy of Deadline who are reporting that Pacific Rim: Uprising is moving in order for a better chance at box office success. In its original date, it would have been coming out just a week after Marvel's highly-anticipated Black Panther. Considering Marvel's impressive track record, going up against a movie like that in its second weekend may not be wise. But there is quite a bit of competition in the new March date as well. 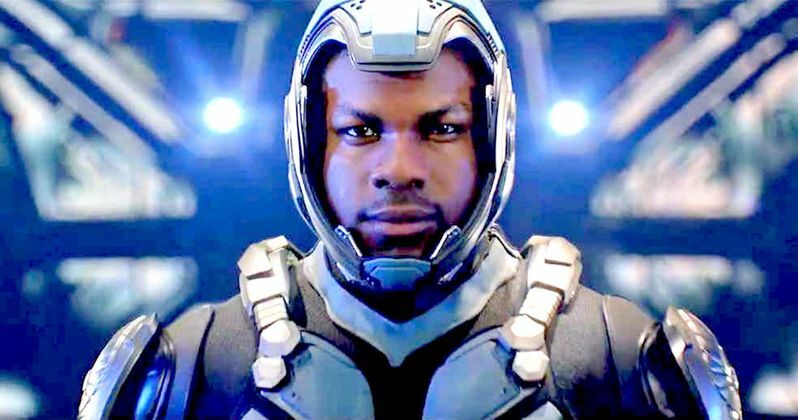 Pacific Rim 2 is now going up directly against the new Robin Hood movie, which stars Taron Egerton and Jamie Foxx, and come out just one week before Steven Spielberg's Ready Player One. Given the excitement that the first Ready Player One trailer was able to stir up after it debuted at San Diego Comic-Con, not to mention that this is a Steven Spielberg movie we're talking about, Pacific Rim 2 is going to have to put up a serious fight to keep its head above water next year. The movie also doesn't have the benefit of Guillermo Del Toro in the director's chair. Due to some scheduling issues, Del Toro decided to go make The Shape of Water instead, leaving Steven S. DeKnight (Daredevil) to direct instead. Maybe some fresh blood can help? Pacific Rim: Uprising takes place 10 years after "The Battle of the Breach" from the end of the first movie. The oceans are still, but restless. Vindicated by the victory at the Breach, the Jaeger program has evolved into the most powerful global defense force in human history. The PPDC now calls upon the best and brightest to rise up and become the next generation of heroes. When the Kaiju threat returns, we will be ready. And rest assured, they will return. What kind of sequel to Pacific Rim would it be if they didn't? The cast for the movie includes John Boyega, Scott Eastwood, Jing Tian, Cailee Spaeny, Rinko Kikuchi, Burn Gorman, Adria Arjona and Charlie Day. Pacific Rim 2 was in doubt for a couple of years following the release of the first movie, mostly due to the fact that the first movie wasn't quite the box office hit that the studio was expecting. Pacific Rim made $411 million worldwide working against a $190 million production budget. That is more than most superhero movies cost, which makes that $411 million take a little less impressive. But the studio found a way to make it work and we are finally going to see a sequel arrive in theaters next year.